Photo of presentation to Jake Considine Kildimo, at De Bucket following his participation in the European Championship in France recently with the Irish Under 18 Rugby squad. Bernard Gloster, Joe Arthur, Jake's father Anthony, Hugh McGrath- North Munster Coach, Jake, Brian MacMathúna, Darragh Arthur, Marty O'Dea, David Considine. In front are Evan and Josua Considine. 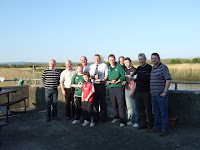 The first outing of the above group will take place to Askeaton on Bank Holiday Monday, May 4. Members and friends will assemble outside the Tourist Office in the East Square at 3.00pm, where we will meet the very able tour guide Tony Sheehy who will conduct the walk and talk. If you haven’t been on this tour before be prepared for a historical feast and if you have been on the tour before, you are sure to learn something new about this unique town. Tony will talk about the Castle’s rich history and the adjacent Hellfire Club as well as taking us to the Abbey or Friary where you will see the unique cloisters and a statue of St. Francis with the stigmata/signs of Christ’s wounds. He will tell the interesting story of the Pilgrim who is buried there and if time permits we will also visit the burial place of the Curraghchase poet Aubrey De Vere in the Church of Ireland grounds. An event not to be missed! Following the success of Kildimo’s previous involvement in the annual week, this year the ‘Kenry Historical Society’ will be including items in the 2009 calendar of events. The dates fixed for the nationwide showcase of Ireland’s rich heritage is from August 22-30. Thus far there are plans afoot for a historical walk in the Ringmoylan area. All aspects of our heritage are highlighted during this special week, so if you know of any interest that might be made public, we’d like to hear your ideas. A nationwide Booklet of events is published every year to publicise Ireland’s involvement in this European event. Perhaps you have something to share with others? Have you a specialist skill you might demonstrate, such as dry stone walling, hedge layering, vegetable production- the possibilities are endless! Following their very successful ‘Easter Egg Draw’, the Association wishes to record their thanks to all those who promoted the event, especially Slattery’s, De Bucket, The Seven Sisters, Liz Hickey and Association members. The winners in the Draw were Nora Doherty, Adare; Jennifer Griffin, Old Kildimo; Joseph White, Cratloe and Aoife O’Shaughnessy of Kilmacat. The Club Development LOTTO Draw No. 25 on Monday 13th April was held at The Seven Sisters with a jackpot of €1,800. The Numbers drawn were 18, 20, 21, 25. The jackpot was not won. We had lucky dip winners going to Pat O’Mahoney, Newcastle West. Helen Browne, Ballycasey. Charlie McCarthy, Ballynacarriga. Bernard Battles, C/O The Seven Sisters. Kildimo GAA Golf Classic will take place at Adare Golf Club on May 8. Contact any club member for further details. Numbers 7, 13, 18 & 23 were drawn for a Jackpot of 4.300 on April 21. Because this combination was not predicted, ‘Lucky Dips’ of €50, €30 and €20 were drawn respectively by Bernie Nolan, John Meade and Anthony O’Neill. The funds raised by the Lotto are ploughed back into the community and your support is welcome. A €2 investment could dispel the recessionary blues! The fundraising committee of the local games wish to thank all who contributed to their Churchgate Collection held this weekend. The annual Sports Day will be held on Mon. May 4, in Pallaskenry G. A. A. field and all are welcome. Stepping off her flight from Australia following an extended family visit ‘down under’ it will be all systems for guild President Mary O’Rourke. First off will be ‘The Killulta ICA Painters’ forthcoming exhibition entitled ‘Bóthairín na Smaointe II’ which will be officially opened this Thursday April 30 at 8pm.The exhibition will hang in ‘De Bucket’ Pub, Ferrybridge during the month of May in conjunction with The National Bealtaine Festival, which encourages creativity in older people. All Welcome. On the following Tuesday May 5, the ICA book club will convene, also at ‘De Bucket’ Pub. Commencing with lunch at 1.15pm followed by bad luck and trouble! This is of course the title of the current book by Lee Child, which will be discussed. With the cooperation of ‘De Bucket’, Ferrybridge new local clothes bank has been launched in their Carpark. This facility is for the reception of clean and usable clothing and is in aid of the ISPCC. The Green Schools Committee will participate in the National Spring Clean during the designated week. 1st year students will be travelling to Galway Outdoor Education Centre, Recess, Connemara, for the annual outdoor education experience in outdoor pursuit activities on Wednesday April 29 and returning on Friday night, May 1, 2009. Congratulations to Junior Girls Soccer Team who won the B Final against St. Pat’s of Shannon 3 – 0 before the Easter Holidays, the U14 Hurlers who beat Doon 7 – 9 to 1 – 0 before Easter, the U16 team who have reached the North Munster Soccer Team Final on Wednesday, April 22, and to Caoimhe O’Neill who received a World Medal at the World Irish Dancing Championships in Philadelphia, USA over the Easter and not forgetting Jake Considine who achieved his 1st Cap for the Irish Rugby U18 Team in France over Easter.